Pai Men Miyak is the sister restaurant of Miyake. Don’t confuse them. The former is a noodle bar on State St. while the latter specializes in serving up sushi on Fore St. I figured I should try one of them soon and on a cold Saturday evening, I thought a noodle bowl might suit me well. We made our way there, pulled off some shenanigans to get a parking space, and walked into the popular Asian joint which appeared to be pretty busy. On this night we were eating early and arrived before 6 pm when there were only a few spaces left at the bar. We love sitting at the bar and definitely didn’t want to wait for a table as our bellys were empty and ripe for filling. We sat and waited for a server to visit, but before one did, we had menus delivered and water served by a surrogate. There were three menus; one appeared to be specials, one was beer and wine, and one was standard fare including signature cocktails. Before much time passed, our waiter came to offer drinks. My wife ordered a chardonnay and I passed since I was driving that night. There were, however, a number of interesting drinks on the menu. We looked intently at the food choices, hoping that there were no bad options, but trying to pick out only the best for our dinner. The menu consisted primarily of Ramen, Sushi, and Small Plates which included gyoza, pork buns, and the like. I really wanted to try one of each type, but I wasn’t sure I could fit all that into me. We decided we would avoid the sushi and if we were still hungry after eating a small plate and noodle bowl, then we would order sushi for dessert. We still had to decide what to actually order and that was no easy task as so much of the menu looked appealing. After lots of contemplation, we finally made some decisions. We started with an order of Edemame to share. I went with Sui Gyoza – steamed chicken dumplings, shoyu, broth, rayu, scallion. Most of the ingredients sounded like characters in Mortal Combat so I figured they had to be good. My wife chose Shrimp Gyoza – pan seared shrimp and	ginger dumplings. Next were the ramen. 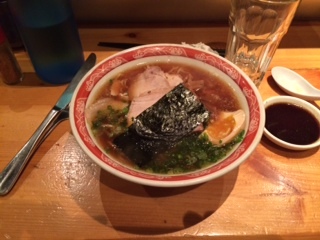 For me, it was the Shoyu with chicken and soy broth, pork loin, soy marinated egg, scallions, menma, nori. My young lady had the Shojin – kombu and shiitake broth, charred cabbage and	carrots, tofu, ginger, menma,	rayu, scallion, and nor. The wait was on. The edemame came out quickly. They were standard and delicious. I chowed a bunch of them down without hesitation. When those were just about done, our gyoza came out. Mine came in a bowl with broth. The shrimp dumplings were served on a plate per usual. I prefer my dumplings steamed because I like the texture when they are prepped that way. I plunged a fork into my first nugget of joy, cut it in half, and then plopped it into my gyoza hole. It was glorious – doughy, well-seasoned, and perfect for soy sauce dipping. I ate more and dipped them all as though I was romancing them in a dance under the starlight. My wife tried the shrimp gyoza and loved them – no dip-dancing for her though. Our dumplings were good as-is and with soy, but I also tried one with a spice combination that was at the bar. It was quite aeromatic and not very salty which was nice because the soy sauce provided enough sodium. They were so good I actually had to tell my wife that my gyoza had some pork in them so she wouldn’t eat any even though they were totally pork-free. We finished our gyoza very happy and hoped that the bowls were just as good. When our bowls came, we were perfectly primed for them. They were large and in-charge with my pork loin slices and egg sitting at the top. It looked pretty for a soup. We both tried ours. I started with the pork. It was tender and flavorful. I added a little soy to the meat and that pumped it up even more. The egg was good and different than any egg I’ve ever had. The broth and other parts were very tasty too. There were tons of noodles and lots of delicious parts to the bowl. My wife found hers to be the same. I finished my entire bowl with a fatality but Mrs. Portlandeater couldn’t finish hers. It was a hearty soup. Sushi wasn’t in the cards as we had just had too much food. I certainly will try it the next time I am there. I’m confident that everything Pai Men Miyaki offers is delicious and the staff are really great. I couldn’t help but notice that the kitchen was working their asses off the entire time I was there. The wait staff was great too with our waiter even taking my coat and hanging it up in their secret coat-hanging area after it fell off the back of my chair. The place was really busy and everyone was keeping up with the demand quite well. By the time we left, the wait for a seat was two hours. In the end, our meals came to about $55 before tip which I thought was very reasonable. The food was great and while I’m very particular about soup in general, their noodle bowls were not only delicious, but they offered a copious amount of food. Pai Men Miyake is the perfect place to quell your winter weather blues and satisfy your craving for Asian food at the same time. Go slurp down some delicious ramen immediately. Your brain freeze will thank you. This entry was posted in Portland, ME food on December 5, 2014 by peterpeterportlandeater.